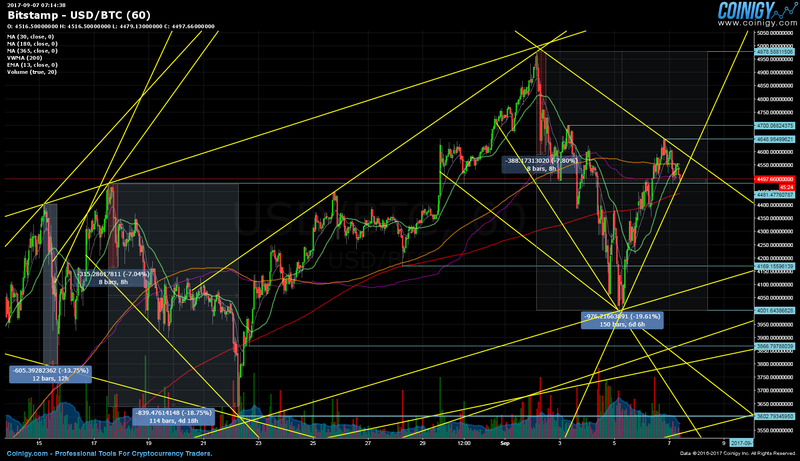 The bitcoin price has persisted on the existing channel, with the current trend vigorously holding since yesterday. Price is staying above the $4,479.44 daily low, and hourly volume strongly following suite, we could start to see the formation of an inverted head and shoulders pattern. The regulatory drama coming from China, and countless other countries, seems to have been shaken off for now. USDT has been drawing a lot of attention with its rather chaotic price swings, which are rather concerning for many in the space, considering that tether is supposed to serve as a safe haven during periods of intense crypto currency volatility. A new article has re-framed old talking points, citing the connection between Bitfinex and Tether, while also drawing comparisons to the still fresh BTC-e fiasco. Dubai’s Aston Developments has begun to accept bitcoin payments for 1,133 apartments that are scheduled to be completed by September 2019. This has been made possible through a partnership with the Knox Group, and the bitcoin payment processor BitPay. Mainstream media has been diligently covering the news with two comprehensive articles that exceptionally stand out. In an article that is sure to draw the ire of bitcoin maximalists, Michael Hiltzik goes into extensive detail, as to why the original crypto currency is a ludicrous investment at these price levels. Robert Shiller reiterates some of his worries, and states that at this point in time, the best modern example of a bubble is chiefly exemplified in the one and only bitcoin. Although there are many who would beg to differ, by pointing out correlations to prior tech trends and similar expansion rates. Coinbase has recently hit a new milestone by acquiring it’s 10 millionth user. Fred Ehrsam, Coinbase co-founder, discusses his latest thoughts in an interview for Yahoo Finance. Why is BTC going parabolic? …not to mention every other exchange/country! How #Blockchain is changing Business? There is still a considerable degree of confusion persisting in regards to SegWit and big blockers. The most vocal proponents of larger blocks, and the accompanying philosophy, are of course Roger Ver and Bitmain’s Jihan Wu. There is no abundance of hate for both, with copious Reddit threads as well as articles, heavily critiquing everything emanating from this alignment of thinking. Although new users of bitcoin, and consequently crypto currencies as a whole, probably have more of an interest in how actual blockchain transactions work. Nonetheless, the multi sided narratives and drama of crypto, are always present on social media and beyond. Bitcoin began trading from the $4,001.93 weekly low on September 5 (GMT 04:00), and after almost 48 hours of constant growth, a new $4,648.98 daily high was reached on September 6 (GMT 18:00). The crypto currency has been ranging ever since, confined between the previously mentioned daily high and the yet to be broken $4,479.44 daily low.